Hip Hop India: Modern Percussion brings together Indian percussion rhythms with hot hip hop beats for the perfect blend you´re looking for. Produced and recorded by Dinshah Sanjana and performed by Sanket Athale, a master player with extensive training in both traditional Indian playing and western music, these sounds are a perfect fit. Instruments include clay pot, manjira, ghungroo, dholak, dimdi, tabla and more. 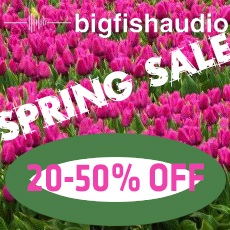 With 49 construction kits totaling over 6 GB of content (2.53 GB of 24-bit acidized WAV files) and every element broken out into it´s own loop, there´s plenty to choose from. Take your beats on a journey to India with Hip Hop India: Modern Percussion. Durchweg gute Aufnahmen, die auf mich und meine Arbeit inspirierend wirken. Mehr darf es immer sein.